The Tiffany family might not have made it to the New World aboard the ‘Mayflower’ but they might still qualify as early arrivals when, sometime around 1660, a certain Squire Humphrey Tiffany arrived and settled in the Massachusetts Bay colony. Some 150 years later his descendants were in business running a general store in Connecticut. The son of this concern, Charles Louis Tiffany, together with his college friend John Young, decided to try their luck setting up shop in New York at 259 Broadway, aided by a $1,000 loan from Charles’s father – the year was 1837 and Charles was 25 years of age. Initially trading as Tiffany and Young the firm is known to have offered stationery and fancy goods. 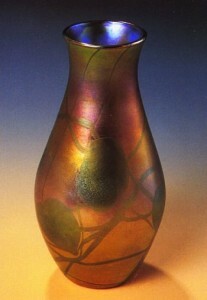 Pictured: Tiffany Glass Lustre Vase – part of the Haworth Art Gallery Tiffany Glass collection. Image copyright Haworth Art Gallery. The enterprise eventually became Tiffany and Co and gained a reputation for carefully selected European objects that benefited from being tastefully displayed attracting both a discerning and growing clientele. By 1850 the company was importing jewellery and that same year acquired a collection of jewels that had once been owned by Marie Antoinette. The firm had prospered to such an extent that by 1887 they were in a position to purchase a significant proportion of the former French crown jewels for the sum of two million French francs. By now Tiffany and Co were jewellers and silversmiths to an elite clientele of multi millionaires with such legendary names as Havemeyer, Gould, Astor and Vanderbilt. This was a stratum of US society keen to offload vast sums of cash on the best that their money could buy and Charles Tiffany was a master at keeping his customers satisfied. His son Louis Comfort Tiffany was born into this rarefied retail outlet in 1848 and had benefited at birth from growing up in a home surrounded by tasteful furnishings of the finest quality. Despite the expectancy that the son would naturally join the family firm it became obvious that he had other ideas and by his teenage years had shown intent to develop his painting skills by studying under George Innes the celebrated American landscape artist working in the Barbizon style. In 1867 he travelled to London and Paris where he developed a fascination with the ‘Orientalist’ approach to painting that sought subject matter of both middle and far eastern themes. The young Tiffany had the additional benefit of being mentored by Edward C Moore who worked for his father and was recognised by all as a significant expert in all matters of historical design and fine art. Over the years LCT made several painting trips to Europe and North Africa where he had become particularly inspired by the simple and pleasing colours of the buildings, instilling an ambition of bringing colour into the buildings and homes of his native country. On one trip he was joined by his friend and much respected fellow artist Samuel Colman with whom in later years along with Candace Wheeler, the much respected needlework and textile designer, they collectively traded as Louis Comfort Tiffany and Associated Artists. Their relatively short lived joint venture was aimed at providing a total interior design and decoration service with Candace Wheeler in particular admitting LCT to be difficult to work alongside due to his obsession with his experimentation with all things glass. Their success appeared to be well and truly consolidated after being commissioned by President Chester Alan Arthur to redecorate several rooms in the White House. Other significant clients included Mark Twain and Lily Langtry – referred to at the time as the ‘Jersey Lily’. Tiffany’s fascination with glass had been nurtured during his early visits to Europe where he studied medieval stained glass in the many cathedrals as well as the early glass displayed in important museums. This interest was also stimulated by the ancient Roman and Islamic glass that he came across whilst travelling around the Middle East. His preoccupation with the commercial possibilities offered by producing aesthetically pleasing art glass began to override his expected involvement with his interior design company. 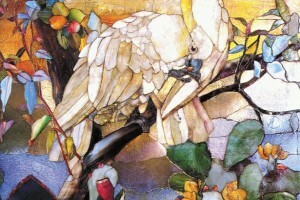 As early as 1878 he had set up his own glassworks employing Venetian glass maker Andrea Boldini as his partner. Unfortunately their enterprise appears to have failed after the works had burnt down on two occasions leading the Italian to resign. Tiffany was however determined to pursue his dream and in 1880 began to file various patents including one that made use of metallic lustres and was to become manifest as his now legendary ‘Favrile’ glass. The term being a derivative of the word ‘Fabrile’ an old English term for being hand made. His efforts and further trialling appear to have taken place across the East River in the Louis Heidt glassworks located in then fashionable Brooklyn. In 1882, three years after parting company with Candace Wheeler and Samuel Colman, his continuing fascination resulted in the founding of the Tiffany Glass Company. The company was initially involved in the making decorative windows that had witnessed a growing demand that was also providing commissions for his one time friend John La Farge. Tiffany’s experimentation included iridescent glass that emulated that uncovered from archaeological sites and eventually retailed as ‘Cypriot’ glass. Other techniques included coloured lustre, wheel carving, paperweight, agate, reactive, lava, cameo and aquamarine. The latter might be considered to be a novelty type of glass albeit extremely difficult to perfect, which therefore accounts for such pieces being relatively rare. The intention was to emulate aquatic weeds, marine life and fish within a solid mass of clear glass encased within an integral vase or bowl or as simple doorstops and paperweights. In 1892 he made the decision to rename his business the Tiffany Glass and Decorating Company, thereby making it known that his interior design service was still operating and attracting no shortage of commissions. More importantly Louis Comfort Tiffany had by now secured the position and reputation of being able to claim the accolade as the most important and respected arbiter of taste on the eastern seaboard. In 1893 he went into business with Englishman Arthur Nash who had previously worked for the celebrated Stourbridge glass maker Thomas Webb. The business was named the ‘Stourbridge Glass Company’ and was established at Corona on Long Island. Although initially set up to produce coloured plate glass for windows and mosaics the output soon began to number hand blown objects. If Tiffany supplied the ideas it was down to Arthur Nash to create whatever that item might be. However some designs did eventually proved too much of a challenge and never made it into the Manhattan showrooms despite LCT demanding more attempts whilst maintaining the dictum ‘If it’s thinkable it’s do-able’. Perhaps the most readily recognisable today of all his varied ouput has to be his wonderful lighting catalogue and here he appears to have been fortunate in acquiring the services of two lady designers in the guise of Clara Driscoll and Mrs Curtis Freschel. The decision to manufacture oil lamps was to some extent the result of making use of glass fragments left over from window and mosaic assembly. Whereas clear and single colour glass is recyclable, the same cannot be said of multicoloured and variegated glass. When shown at the Paris Exposition of 1900 his Dragonfly table lamp designed by Clara Driscoll was awarded a gold medal. Consequently a Tiffany table or standard lamp soon became an essential accessory for most middle class American homes. It seems strange therefore that LCT himself did not appear to take them seriously as art objects as his 1913 retrospective exhibition did not include a single lamp. It is worth is noting that his determination to continually strive for new techniques at all costs goes some way in explaining just why over a period of almost forty years the glassmaking concern failed to return any meaningful profit. Tiffany never let such an incidental as mere money deter him from his continual pursuit and perception of beauty. The year 1893 also saw the arrival of twenty year old Joseph Briggs who had already been in the USA for three years having spent some time employed on a wild west show. Originally from Accrington in Lancashire, Briggs was determined to work for Tiffany and had made several attempts to secure a position ever since arriving in New York but without success. Almost thirty years ago I was fortunate in having the opportunity of having a telephone conversation with his then elderly son who recounted the events his father had told regarding how he eventually secured a job. Joseph Briggs was to eventually move from his lowly first post and began to move up the corporate ladder working in the ecclesiastical and mosaic department before moving into higher management. Some forty years later he had become LCT’s right hand man, being made responsible for winding up the company and filing a petition for bankruptcy in 1932. Tiffany was to die in January 1933 shortly before what would have been his 85th birthday, whilst Briggs was left with the unenviable task of disposing of a remaining stock then perceived as simply unfashionable with values now measured in cents that had once been the same but in dollars. Sadly Tiffany died at a time when he was barely remembered as a giant of interior decoration and had found himself unable to come to terms with the contemporary art movement and Art Deco. In truth he was by then of the firm opinion that beauty had all but deserted the modern world he was about to leave behind. That same year Joseph Briggs returned to his native Accrington together with his lifetime collection of Tiffany glass, giving half to family and friends and the remaining almost 150 vases, tiles and mosaics, to the Corporation of Accrington – Hyndburn Borough Council. Today this same collection is proudly displayed in the Haworth Art Gallery, off Manchester Road in Accrington. It is needless to say well worth a visit. Just tell them I sent you! Tiffany Glass and the Accrington Connection by Eric Knowles. Originally published in ARC Magazine.